So I have a '96 Husaberg FC600 that I've been collecting parts for. One of the parts is a big rally tank that extended around the radiator on each side. I also have one of the small aluminum under-seat tanks that I'm currently fussing into place. I'm wondering if anyone knows how much fuel each of these tanks actually carries. The rumors are that the under-seat tank is about 3 liters and I've heard varying estimates for the big tank from 4 gallons to over 5 gallons. I suppose that I'll know for sure once I've got everything mounted up and I actually go to fill it but, knowing how slow my projects move these days, that could be a while. Look in the Service Manuals section at the 2000 sales brochure. The Rally tank is 19 Liters or 5.01 Gallons. The side number plate tank is 5.5 Liters or 1.45 gallons. The plastic under seat tank for gen 2 frames 2000-2008 holds about 1 gallon. Perhaps it might fit the gen 1's with some encouragement. The under seat tank you have is an aftermarket tank possibly made by Eric's in Pasadena. I think it holds less than a gallon. Sure enough, that's the tank I've got. And, yes, the under-seat tank does say "Eric's" on it. There must have been a hardware kit that came with the big tank because there's no way the stock forward mount nut will fit with the big tank in place. I'm assuming the Eric's tank is just secured with zip ties. It just doesn't fit very well between the mud guard and the shock. Currently doing surgery to remedy. I'll probably end up just attaching a few adhesive bonded studs to the bottom of the tank and then securing the bottom half of the mud guard with some angle brackets. Maybe this thread will be a good place to document everything. So, according to the 2000 brochure, and if the 3 liters is correct for the Eric's tank, I'll have a total of 5.79 gallons! Now to figure out where to carry some oil so I can do an oil change half way through my fuel load. LOL! Yes there are brackets that come with the tank. I will post some pics in the future. The gen 1 motors burn a lot of oil. Running out of oil is just as much of a concern as is running out of gas. 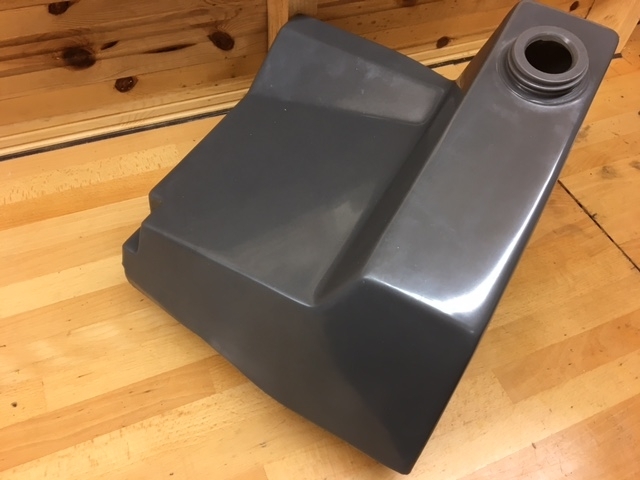 Perhaps use the under seat tank to hold extra oil to top off the crankcase every 2-3 hours and get a side number plate tank for even more increased fuel capacity. Yes! Pics of the brackets would be tremendously helpful. I have heard that the early engines burned oil. In one case my experience is different. My 501, which is a '95 vintage engine and still on the original piston and rings (maybe around 100 hours total) does not burn oil. I've got a Clarke tank and just picked up an under-seat tank for it off of ebay just this morning so I'll be doing more long distance rides and will definitely monitor this. My 600, on the other hand, is running a lightly used KTM 525 piston and rings (from a friend's bike when he upgraded to a 570 kit) and it burns a LOT of oil...and rightly so. There's oil throughout the intake and, when I popped the head off to replace the head gasket a few days ago, even on top of the piston. There must be massive blowby. It just needs to last long enough for me to get my spare engine together. Looking at the brochure, is it true that Husaberg made a factory rally bike that came with the big tank? I remember seeing a Husaberg 600 quad for sale a few years ago on CL so I guess that it should come as no surprise. Looking at the brochure, is it true that Husaberg made a factory rally bike that came with the big tank? Yes. Take a look at my avatar and there is a pic in the 2000 sales brochure. The 2000 FR600. It was basically a 99 model with the large tank, side panel tank and 2000 front end (forks, fender etc.). we have this tank. one left. also we have a weird fuel tank that looks and I say "looks" like it would go under the seat? I have put a photo of the underseat 'weird thing' elsewhere here. Last edited by Taffy; July 9th, 2017 at 03:17 AM.